On First Anniversary of LRA Bill, What’s Changed? It’s been a year today since President Obama signed the Lord’s Resistance Army Disarmament and Northern Uganda Recovery Act, to much optimistic fanfare. 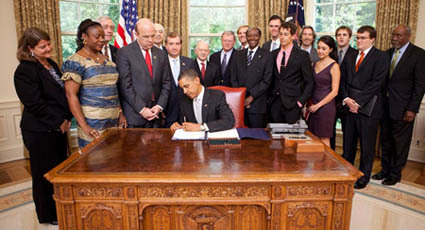 This landmark legislation, supported by a broad bipartisan coalition, required President Obama to develop a strategy for eliminating the threat posed by the Lord’s Resistance Army, or LRA, a brutal rebel group that has been terrorizing civilian populations in central Africa for nearly 25 years. So, one year later, what has changed? With a current force of about 400 fighters, the LRA remains a serious threat to largely defenseless populations in northeastern Democratic Republic of Congo, eastern Central African Republic, and southern Sudan. The number of attacks by the LRA increased significantly during the first three months of this year. In particular, there has been a spike in LRA attacks in Congo, which is likely because LRA leader Joseph Kony and a large group of LRA fighters – as many as 250 or 300 – are located there. Kony returned to Congo in late 2010 or early 2011 with his group of more than 100 fighters, and the number of attacks, abductions, and killings by the LRA in Congo has risen since then – probably as a result. In southern Sudan, U.N. OCHA observed a dramatic increase in LRA attacks during the first three months of this year. The LRA also appears to be on an abduction spree to rebuild the size of its force, down about 50 percent since before the Ugandan-led military offensive in late 2008. In the midst of these worrying developments, OCHA identified some good news. The total number of deaths and abductions in the region decreased in the first quarter of 2011, compared to the same period in 2010. OCHA also observed a decline in attacks, deaths, and abductions in CAR, but the reality is that the target of these atrocities likely merely shifted with Kony and his men’s move to Congo. In the face of these threats, civilian protection efforts have offered scant consolation. The U.N. peacekeepers in Congo lack enough forces to be deployed throughout affected areas, the necessary transport capabilities, and robust rules of engagement. The Congolese army has been engaging the LRA recently, although not as often as necessary. A U.S.-trained, Congolese light infantry battalion was recently deployed to the Dungu area. In southern Sudan, the SPLA and the U.N. peacekeeping force, UNMIS, are preoccupied with other challenges and similarly lack the necessary resources. In CAR, there is no longer a U.N. force to protect civilians, as of January, and the Central African Republic army lacks the ability and will to effectively protect civilians. Civilians are otherwise generally defenseless or rely on local militias, like the Arrow Boys in southern Sudan, for protection. The military effort led by the Ugandan Peoples Defense Forces, or UPDF, has been vastly under-resourced and largely unable to apprehend the LRA’s senior leadership and protect civilians. During the past year, the Ugandan army has drastically reduced its presence in LRA-affected areas, diverting thousands of its troops to the African Union mission in Somalia, and to Uganda ahead of the elections that took place in February and for the volatile Karamoja region. There may be as few as 2,000 UPDF troops currently in LRA-affected areas, compared to the 7,000 Ugandan troops deployed during the height of the UPDF-led, U.S.-supported Operation Lightning Thunder. In July 2010, Uganda’s defense minister announced that there were no funding provisions in the country’s 2011 budget for the military offensive against the LRA, necessitating that funding would have to come from international partners. The other armies in the region, particularly in CAR and southern Sudan, have demonstrated even less resolve fighting the LRA. Furthermore, regional efforts are fraught with tensions and have been undermined by a lack of cooperation between the armies of Uganda, Congo, CAR, and southern Sudan. Congolese army officials have accused the UPDF of looting natural resources while deployed in Congo to fight the LRA. In CAR, as of April 2011 most of the Ugandan troops were confined to their bases after CAR’s President François Bozizé asked the UPDF to withdraw to two bases in late 2009, possibly in the hopes of receiving international support, particularly from the U.S.
As a result, progress to apprehend the LRA leadership has been hampered. No senior commanders have been apprehended (or killed) by the UPDF-led effort since December 2009. In particular, Kony and his two commanders – all wanted by the International Criminal Court – remain at large. Kony and his group of fighters have returned to Congo and have had the opportunity to regroup and reorganize. Allegedly, he has returned to the Haut-Uélé district of Congo, possibly heading for Garamba National Park, the site of his former base of operations, where a meeting of key LRA leaders reportedly took place in late April. In addition, according to Ugandan officials, significantly fewer LRA fighters were captured and killed in 2010, compared to 2009. Also concerning is the stymied progress on efforts to encourage LRA commanders and other fighters to defect from the LRA. In contravention of the Ugandan Amnesty Act of 2000, Kampala stopped granting amnesty to escapees or captured combatants at the end of 2010 and began prosecuting a former mid-level LRA commander who was captured by the UPDF. These developments have seriously limited progress on critical efforts to disarm, demobilize, repatriate, resettle, and reintegrate LRA fighters. There have been some minimal efforts by international and regional players to address the LRA crisis. In October 2010, regional governments, through the African Union, agreed to several initiatives: the formation of a joint brigade to fight the LRA; joint patrolling of the countries’ borders; a joint intelligence and operations center; and the appointment of an AU special envoy for the LRA. The implementation of these initiatives has been slow and will rely on the commitment of and cooperation between the regional governments as well as the allocation of funds. The U.S. is arguably the most active government outside of Africa’s Great Lakes region on the LRA, and its involvement has been both an encouragement to many on the ground and a reminder to regional and international partners that the LRA issue matters. But despite the historic, bi-partisan Congressional mandate to end the LRA threat, the Obama administration continues to under-prioritize the implementation of the strategy. Today, the Enough Project with our partners, Resolve and Invisible Children, released the second issue of President Obama’s LRA Strategy Report Card, which grades his administration’s efforts to date. You can send a message to Obama asking him to do more to end the LRA threat.